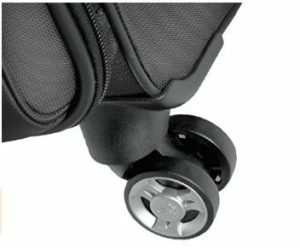 Should You Go With Spinner Or In-line Wheels For Your Luggage? If you are a frequent traveler, you know just how important it is to choose the right luggage. You not only need a suitcase that can accommodate all your belongings, but you need one with the appropriate maneuverability, versatility, and flexibility. This is where the main consideration of choosing between wheels comes into play. While there are a variety of different wheels available on the market, you will find that the most common choices are the in-line and spinner wheels. So, which is better for you and how do you go about making your decision? What Are Suitcase Wheels Made Out Of? Before you start looking at comparisons of the best spinner and in-line wheels, you really need to understand the materials that are used to construct these wheels. First off, you need to know that in-line wheels are constructed of polyurethane, which is a high resilient flexible plastic. This material provides the in-line wheels with complete durability. Due to the polyurethane material, the incline wheels are without a doubt the most durable type of wheel available on the market today. Most other wheels utilize rubber and plastic, which is okay, but tend to wear down quickly and make it harder to maneuver the luggage. Spinner wheels on the other hand should be viewed in theory as bicycle or car wheels. They have a rubber material that is stretched over the hub of the wheel. There is simply nothing wrong with this because in theory it works excellent for bikes and cars. However, if the spinner wheel is not constructed properly the tread can come off. This will then cause the bag to roll unevenly or stop moving altogether, which is something you do not want in a busy airport. Now, that you know about the different types of materials, you are probably wonder what each wheel is and what it has to offer you and your luggage. Well, spinner wheels are pretty much what the name suggests. They are a type of wheel that offers a comfortable 360-degree rotation. Due to this rotation ability, the spinner wheel has the ability to move in just about any direction. 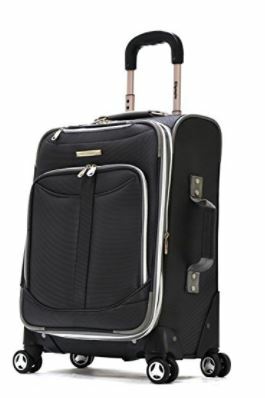 Most suitcases that are equipped with spinner wheels will come with four, six, or eight wheels. Most of the time, the number of wheels depends on the size of the luggage. 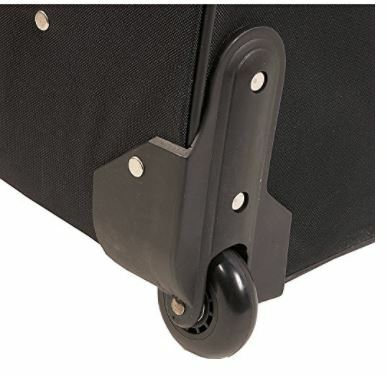 Spinner wheels are truly unique because they give the owner the ability to pull the luggage, scoot it beside them, or even push the luggage in front of them, if they want. The wheels also really make maneuvering the luggage virtually effortless. If you want to breeze through checkpoints and crowded airport terminals with ease, the spinner wheel is without a doubt your go to choice. When you are choosing from spinner suitcases, you will have two main choices, which will consist of soft shell spinners and hard shell spinners. 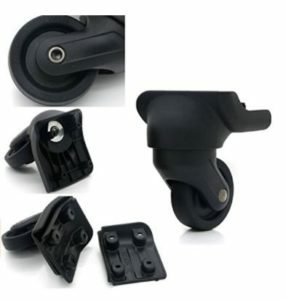 Soft Shell Spinners – The soft shell spinner suitcases are usually constructed of ballistic nylon or polyester material, and they are significantly more expensive. Some of these suitcases can even be constructed of leather for more durability, but are even more expensive. 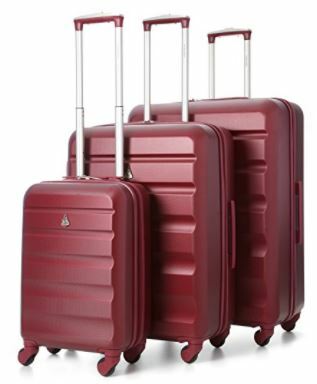 Hard Shell Spinner – The hard shell spinner suitcase is without a doubt the most popular type of case, as they come in a variety of bright colors. In addition to this, they usually come attached with a lifetime warranty as well. As mentioned above, the inline wheel is constructed of polyurethane material, which makes it extremely durable and resilient. Unfortunately, these wheels do not provide the type of maneuverability like the spinners do. Most of the time, with the suitcases they can only be pulled from behind or rolled in front of you. With that being said, they are still extremely easy to maneuver over rough and uneven surfaces, and usually weigh less than the spinners. The lightweight design makes them ideal for people who like to travel lightly. In most cases, when you purchase a suitcase with in-line wheels it will come equipped with two or three wheels on the bottom side. Located on the other side you will find a stopper, which provides the luggage with the ability to stand of straight. The stopper also prevents the luggage from rolling around aimlessly. When it comes to the differences between these two types of wheels the most noticeable difference has got to be the maneuverability factor. 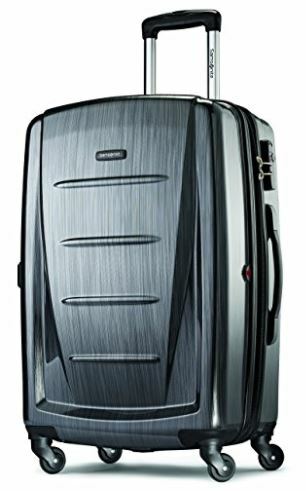 Spinner wheels can literally rotate 360 degrees, so this luggage can be maneuvered in just about any direction of position imaginable. The next most noticeable difference has to be the material that each are constructed of. The materials of the in-line wheels are extremely durable, which gives them the ability to stand to harsh conditions and provide a long lifespan. The spinners are designed more like a car wheel, and still can provide durability and longevity, as long as they are constructed properly. Can You Replace Luggage Wheels? One of the best things about both the spinner and the in-line wheels is that they can be replaced or repaired. In the event that the wheel becomes too worm or damaged you can make the necessary repairs or replacements on your own. However, some models might be harder to work on than other, which can require the assistance of a professional luggage technician. If you’re an easy-going traveler, or you’re the type who often goes on business trips, spinners will be great. You can walk through miles of airport halls or office buildings without much trouble as most of the weight is taken off your burden.